The David Whitney Building is situated in Detroit's Entertainment District, which boasts four professional sports teams (the Pistons, Lions, Tigers and Red Wings). 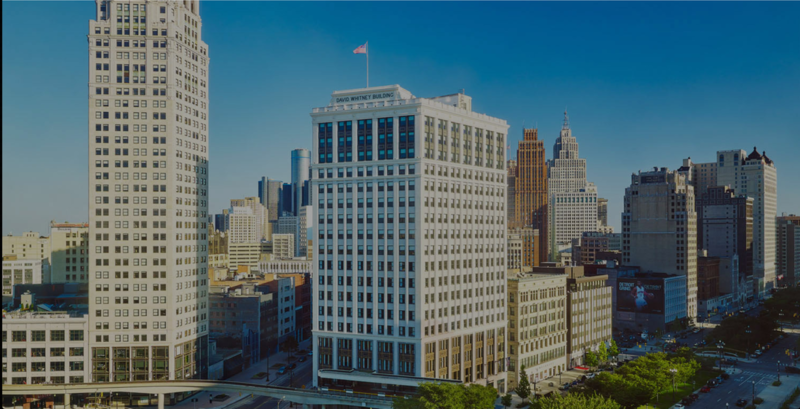 In addition to being in the heart of the densest sporting arena district in North America, guests are walking distance from the nation's second largest theater district and Detroit’s best shopping and dining. The home field to Major League Baseball’s Detroit Tigers, Comerica Park also hosts concerts and special events throughout the year. Originally opened as the Capitol Theater on January 12, 1922, this lavish Italian Renaissance theater was the fifth largest in the world. Today, it is home to Michigan Opera Theatre and the site of many of the world’s best dance performances, Broadway shows and concerts. A converted movie theater that opened in the 1920s, this elegant theater featuring Corinthian columns and dramatic chandeliers, holds up to 3,000 guests who come to see a variety of artists; which in the past has included the Flaming Lips, Massive Attack, and Fergie. This beautifully restored historic theater features a six-story lobby and hosts concerts, comedy shows and family events like The Rockettes and Sesame Street Live. Slated to open in late 2017, Little Caesars Arena will replace Joe Louis Arena and The Palace of Auburn Hills as the homes of the Detroit Red Wings of the National Hockey League and the Detroit Pistons of the National Basketball Association. This multi-purpose indoor stadium is the home of the National Football League’s Detroit Lions and also the site of Detroit’s biggest concerts and special events.